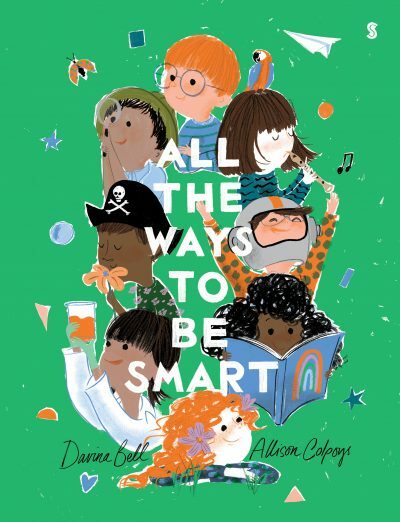 There are many ways to be smart, and frequent collaborators Davina Bell and Allison Colpoys explore several of them in this new picture book: concrete skills such as building cubbies and making slime, emotional skills such as overcoming fear and taking chances, as well as more traditional skills such as identifying shapes and colours. As Bell summarises in one of the book’s standout moments: ‘Smart is reading, writing, spelling, but it’s also storytelling. Finding things on all the pages.’ Every page of this book is joyous, imaginative and life-affirming. Written in rhyming text that does not falter, it’s great fun to read aloud, and would merit many re-readings and further discussions between adults and children. Colpoys’ distinctive illustrations are perfectly matched to the text. They are playful and full of movement and vivacity, with a sophisticated palette of green, apricot, blue and black that imparts a charming retro aesthetic, while still feeling contemporary in tone and content. There are also plenty of instances of understated and incidental diversity in all the illustrations. Suitable for children aged two to six years old, All the Ways to be Smart is a celebration of what childhood can be, and it will likely become a classic.